From David to Solomon we have seen the importance of the seven species. In Part 1 of this two part series we saw how from threshing floor to Holy Temple, from songs and proverbs to the King’s Valley garden, that both man and God loved not only Jerusalem but God’s gifts of the vine, branch, and stalk. 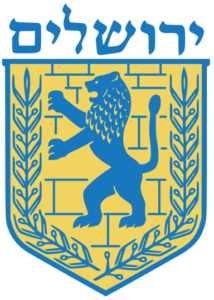 As Solomon’s reign ended, so did the unification of the twelve tribes. Solomon’s son Rehoboam, residing in the City of Jerusalem, became king of the southern kingdom, Judah, which consisted of the tribes of Judah and Benjamin; Judah including the line of David, and Benjamin including the line of Saul. The ten remaining tribes were of the northern kingdom, Israel. With the northern kingdom ruler’s lack of observance of God’s laws, Israel did not remain a kingdom for much more than 200 years. Meanwhile, the southern kingdom of Judah, more faithful to God’s commandments, remained for nearly 150 years more—until Jerusalem was captured by the Babylonians. Image Credit: Bible Gateway. Dates given are approximate and many historians will give similar but not identical dates. Additional scriptures can be found for some of the kings and/or prophets. Rehoboam, and the following kings of Judah, ruled with varying degrees of observance toward God, yet only a small portion of kings remained truly faithful to God throughout their lives and reigns. Asa, Jehoshaphat, and many other kings did much to please the Lord and help their people through their years of kingship. Yet, Hezekiah was the first king after the split of the twelve tribes, who followed the will of God with such stanch devotion, and in turn built up the kingdom of Judah. Hezekiah was not only devoted to the Lord and responsible for much improvement to the kingdom of Judah, but he was also one of the only kings whose name has been specifically found within the archaeological record. 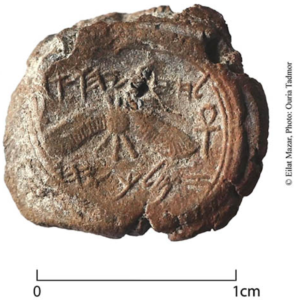 Not only did the Assyrian king Sennacherib bring mention of Hezekiah in his annals, but also a seal, or bulla, of Hezekiah was found by archaeologists in Jerusalem bearing the inscription, ‘Belonging to Hezekiah, (son of) Ahaz, King of Judah’ (see image below). This seal is a physical reminder of a king who followed the Lord, and it was found mere meters away from the southern wall of the Temple Mount—the very location of the threshing floor made Holy. In the Word it is said of Hezekiah that: “He trusted in the Lord God of Israel, so that after him was none like him among all the kings of Judah, nor who were before him. For he held fast to the Lord; he did not depart from following Him, but kept His commandments, which the Lord had commanded Moses. The Lord was with him; he prospered wherever he went. And he rebelled against the king of Assyria and did not serve him” (2 Kings 18:5-7). The Assyrian king, Sennacherib was the main threat to Jerusalem in Hezekiah’s time. Yet, he did not prevail. Hezekiah built up walls and towers of protection for his people, and he turned the people back to God, smashing false idols and keeping his people from false worship (2 Kings 18:4, 2 Chronicles 31:1-21). Hezekiah also fought against the Assyrians by hiding or closing off the water sources outside the city of Jerusalem, so no invading force would have easy access to water (2 Chronicles 32). 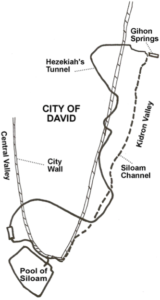 The Siloam, or Hezekiah tunnel, built in place of the previous water channel to hide and bring water from the Spring Gihon, to this day is still a functioning example of Hezekiah’s water solutions (see images below). 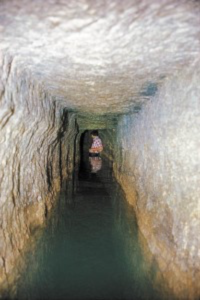 According to an inscription found within the tunnel two teams of men with picks, one from the south and one from the north, began tunneling from both ends until their picks met in the middle (see images below). Methods such as these kept Hezekiah’s people, as well as many generations to come, safe during times of warfare. The Lord answered Hezekiah’s prayers, first defeating 185,000 Assyrians with one angel of the Lord, then removing Sennacherib who returned to Ninevah and met his end at the hands of his son(s) (2 Kings 19:35-37; Babylonian Chronicle; Ninevah Prism of Esarhaddon). After this, Isaiah the prophet came to Hezekiah telling him that his life was about to end. Yet Hezekiah turned to the Lord again in prayer and the Lord extended his life by fifteen years (2 Kings 20:1-7). Indeed not only did the Lord heal Hezekiah, but he turned back the shadow ten degrees as a sign to Hezekiah that His promises would be fulfilled and that Hezekiah would go to the house of the Lord on the third day (2 Kings 20:8-11). While Hezekiah is not likely to have crafted the King’s Valley garden due to his attentions being taken by the threats to Jerusalem, his health, and the return to following God, the garden would have still been present during his lifetime. Situated in the Kidron Valley between the Temple and the Mount of Olives, the King’s Valley garden would have been filled with the seven species, which graced not only the garden, but the Temple. In fact, not only would they have been seen in the Temple and the King’s Valley garden, but in the Temple offerings as once again the people turned back to the Lord and away from false worship. Therefore, we see that while Hezekiah ruled during a time of trouble, he was greatly blessed by God. Hezekiah’s prayers were answered repeatedly, he was wealthy with not only gold and gems, but with wheat and barley for eating and sacrifices, grapes for wine, and olives for oil, and the people of Jerusalem were spared from captivity during his lifetime (2 Chronicles 32:27-30, 2 Kings 19). Tel Dan, or the House of David inscription. 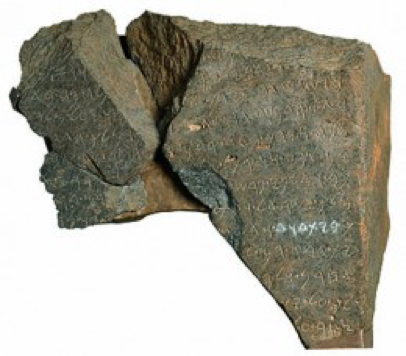 The inscription commemorates the victory of an Aramean king over his two southern neighbors: the ‘king of Israel’ and the ‘king of the House of David.’ This is one of the only known ancient references to the House of David, and therefore King David. Solomon being a king of a peace-filled nation that followed God and was financially sound is more likely to have had the time and resources to build the King’s Valley garden. Additionally Solomon was an avid crafter of gardens and pools─both for beauty and use for crops and irrigation. His father David’s warfare allowed for Jerusalem and all of Israel to live in a period of peace, building the Temple through Solomon, and creating a city most holy. After Solomon’s death the split of the tribes caused the peace to end, yet, Jerusalem managed to grow. 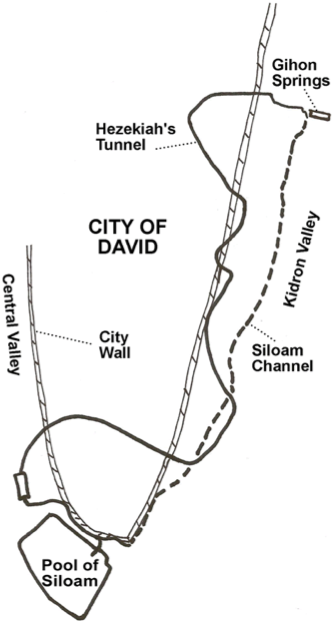 By the end of Hezekiah’s lifetime, the City of God had grown at least ten times the size of David’s Jerusalem. Only a small number of kings reigned in Judah after Hezekiah, and most of them reigned with little hope of a long independent future. The last, king Zedekiah, was no more than a showpiece, as the Babylonians were already beginning to take over—destroying the Temple as God had told Isaiah and Hezekiah (2 Kings 20:16-18). Yet, God made many promises regarding His people and Jerusalem—they would endure. Therefore even as the City of Jerusalem and her people were taken captive, God’s promises endured, as they do to this very day. The City of Jerusalem and the King’s Valley have been awaiting the fulfillment of God’s promises; of not only the renewal of the city, valley, and people, but also the ultimate coming of Messiah. Today, we are working to fulfill these promises in the My Olive Tree, King’s Valley Seven Species Project. Through the planting of the seven species the city is being renewed, the valley is being restored, the people are seeing the love of Messiah, and the land is being prepared for His coming. Messiah will walk through the valley and up to the City of Jerusalem, passing by the stalk, branch, and vine planted. Just as the ancient kings of Jerusalem built up the King’s Valley garden, so we are rebuilding it, as a sign of love and faith to our Father. Loving His gifts, His words, believing AND doing all He said. For more information on the Kings of the King’s Valley and the importance of the Seven Species, you can view Part 1 of this two part series [CLICK HERE]. Additionally, you can visit the My Olive Tree, King’s Valley Seven Species Project, or read other articles such as, Why Jerusalem? : Discovering The Seven Species Through Her Ancient Past.